I’ve been a late adopter of the 500–series concept, but now that I’ve finally got into the idea of having a bunch of interchangeable and relatively affordable hardware plug–ins in a ‘Lunchbox’ (or two), instead of a whole wall full of expensive 19–inch rack units, it’s proving irresistible. Recently, I’ve been on the lookout for a couple of pairs of high-quality microphone preamps, so Sonic Farm’s latest creation, the Silkworm 500–series solid–state mic/line/instrument preamplifier, came to me for review at a most opportune moment. Sonic Farm describe their Silkworm as a “clean” preamp, by which they mean that its gain stage is designed for maximum transparency, with a low distortion transformer at the microphone input and a FET buffer IC on the instrument input. But the word ‘clean’ tells only part of the story, as this preamp boasts plenty of tonal options. The signal passes to a discrete op amp circuit that drives either a solid–state balanced line driver or a ‘100 percent iron’ output transformer. The range of available gain is controlled by both a three–position (High/Low/Medium) gain switch and the variable trim control, allowing for a maximum of 66dB on the mic input and 42dB on the instrument input, and a maximum output of +28.7dBu. Besides the expected switches for phantom power, ‘phase’ (polarity) and a –20dB pad, the Silkworm’s front panel also carries a somewhat mysterious three–position (Smooth/Present/Warped) Vibe voicing switch. The manual demystifies the switch a little, describing it as a “complex impedance manipulator”. In the Present position a mic ‘sees’ an input impedance of 8kΩ, and this produces the most natural–sounding frequency response. The other two positions bring in capacitive/resistive networks that, in the Smooth setting, reduce the higher frequencies somewhat, the result of which is a ‘warmer’ sound. The Warped setting, on the other hand, mildly boosts the high-mid and treble frequencies, typically at around 8–10kHz, depending on the mic’s output impedance, and its reaction to the Silkworm’s network loads. Another design feature worth remarking on is that there are, by default, no coupling capacitors in the main signal path; the only ones that appear are those which can be switched in by the user, as part of the Vibe voicing circuit. This approach eliminates phase shifts — that is, it allows for a ‘cleaner’ sound — while an active dual–stage servo loop minimises any DC offset (the purpose for which coupling capacitors are normally used). Once you’ve familiarised yourself with which legends apply to which switches, operating the Silkworm is entirely intuitive. With the Vibe switch in the Present position and the output signal flowing through the solid–state line driver, the Silkworm is the epitome of clean, with the input transformer adding just a hint of character that manages to keep things from sounding too clinical. Switching so that the signal is routed through the output transformer, the sound starts to warm up, and there are additional variations to be found in upping the gain and pushing the Silkworm harder (for more characterful results, passive attenuation may be required if your mixer can’t cope with +28.7dBu). At first, I tended to prefer the sound of the transformer output, but as I grew accustomed to the Silkworm, I often found myself switching over to the solid–state option when I needed a little more detail or clarity without disturbing the tonal balance. The Vibe switch is the Silkworm’s killer feature, as it gives you two additional and very different sonic starting points to work from or with. For the way that I approach recording, I found that the most effective way of working was to start ‘flat’ in the Present mode, build a sound that worked using either the solid–state or transformer output, and then experiment with the Smooth and Warped settings and the two types of output. Once familiar with how these Vibe settings interacted with my own mics (moving-coil dynamics tended to be the most obviously affected), I found myself swapping my mics around as well. The one aspect of the Silkworm that I liked above all else was that getting the best from every source and every mic always resulted in a different voicing setup. If you do the maths, you’ll realise that the Silkworm produces six distinct sounds, and that these are further multiplied by the number of different mics that you own — and that’s before you start experimenting with pushing the gain up to ‘drive’ the output transformer. The Silkworm is an extremely versatile, and great–sounding mic and instrument preamplifier, and it handled with ease every microphone and sound source that I tried with it. The range of possible voicings (modern to vintage, clean to coloured) meant that I could tailor the Silkworm’s response to capture sounds as I wanted to hear them. 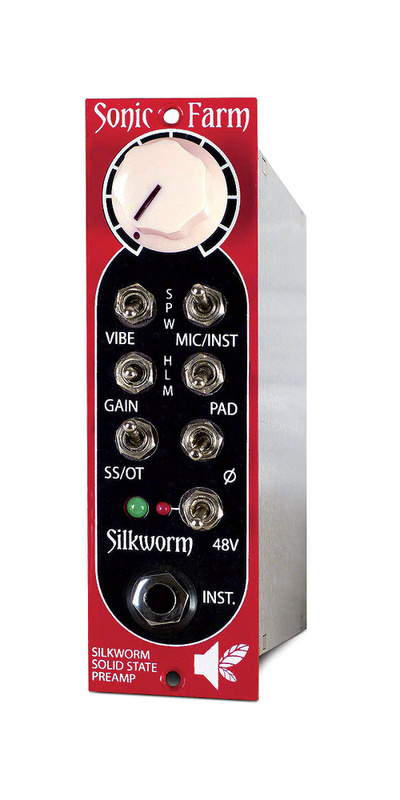 The Silkworm is also an excellent preamp/active DI for guitar and bass and, with the output transformer in circuit, it makes a great device for re-amping. There are plenty of high-quality preamps available now, but I have to say that the sonic possibilities offered by Sonic Farm’s Silkworm made me experiment more than I’ve tended to in recent years — and that alone makes it a must–buy in my book. And if you’re already into experimenting, it should be equally desirable! In short, if you’re in the market for a preamp of this quality, you really ought to audition a Silkworm. I think that you’ll be seriously impressed. Full DC path — no coupling capacitors. Servo control for minimal DC offset. Microphone input impedance: 8kΩ (for middle Vibe–switch setting only; more complex for the other two). Frequency response: 5Hz to 50kHz ±3dB. Gain stage THD at 1kHz: <0.0005%. Input mic transformer THD at 0dBu: 0.03% at 100Hz, 0.01% at 200Hz, 0.001 % at 2kHz, 0.0007% at 10kHz. Output transformer THD 20Hz to 20kHz up to 10dBu: <0.15%; up to 20dBu <0.2%; up to 28dBu <1%. Maximum gain 66dB (mic) and 42dB (instrument). Cinemag 100% Iron output transformer. Switchable transformer or solid–state balanced output. Gain regulation: 3–position range switch and trim control. Dimensions 24 x 20.5 x 11 cm. Variable sound character, with three switchable voicings. Cinemag input and output transformers. Output can be switched to solid-state. Once you’ve heard one, you’ll want two! 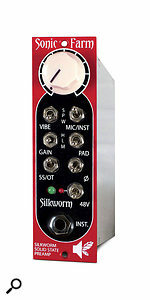 The Silkworm is an extremely versatile, great–sounding microphone and instrument preamplifier. The Cinemag input transformer, switchable voicings and switchable transformer and solid–state output stages mean that it can deliver a sonic character ranging from modern to vintage and from clean to coloured.